Roles are assigned to swimlanes and determine who or what in your business organization is responsible for performing the work of your process-based application. The key to designing a business process is to determine the people and roles required to complete each task that requires user interaction. Some tasks may be performed by any user or handled automatically by the system. You use swimlanes to group flow elements based on the roles defined within your business process. Roles are used to decide who or what is responsible for performing the work that is performed within your business processes. Roles allow you to define functional categories that represent job functions or responsibilities within your organization. The roles defined in your business process are also referred to as logical roles. When your application is deployed to the runtime environment, these roles are mapped to LDAP roles that correspond to the users in your real-world organization. You can create and edit the required roles responsible for completing activities and tasks within your business process and assign them to the horizontal swimlanes. Loan Officer: Loan officers are responsible for creating the loan request and forwarding it to the loan processor. Loan Processor: Loan processors are responsible for reviewing the loan application and checking the credit history of the loan applicant before forwarding the application to the underwriter for approval. Underwriter: Underwriters are responsible for reviewing and approving the loan application. Additionally, they disburse the loan if it’s approved. Swimlanes are the horizontal lines that run across the process editor canvas. All flow elements must be placed within a swimlane. Swimlanes that contain user tasks must have roles assigned to them. Swimlanes visually display the role responsible for performing each flow element within your business process. Additionally, you can have multiple swimlanes that are assigned to the same role. You can also explicitly define a different role for a specific flow element if it needs to be different from the roles assigned to the swimlanes. Swimlanes can make your business process more readable when you must use the same role in different parts of the same business process. When you create a new business process, a default swimlane is created. You can add additional swimlanes to your business process as necessary. When adding interactive and manual activities to a business process, you must assign a role to the swimlane. As shown in the following illustration, the process editor canvas is divided into swimlanes. Each swimlane displays the role of the person responsible for performing the tasks displayed within each swimlane. For example, for a travel request approval business flow, you may have two swimlanes. The Employee role is assigned to the first swimlane and the Approver role is assigned to the second swimlane. 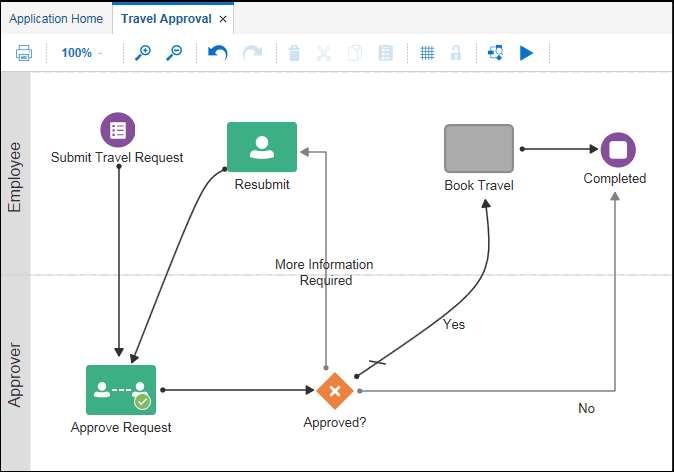 The Approve user tasks appears in the second swimlane so process participants assigned to the Approver role are responsible for performing these tasks. Open your application and then open the process. Click Create New Lane at the bottom of the page. Click the role name for the swimlane and then click Edit . Assign a role to the swimlane. To assign an existing role to the swimlane, select the role from the drop-down list. To assign a new role to the swimlane, click Add Role and enter the name of the new role. Change the background color of the swimlane if you want.